p>Dreams do come true sometimes! 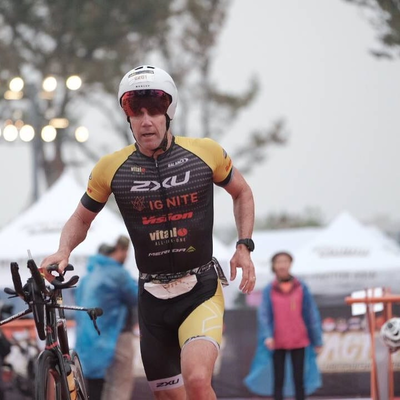 I've been dreaming about winning my 12th New Zealand Ironman for the past few months and breaking the course record and that all happened yesterday. The day started with perfect conditions, Lake Taupo was still and flat, a welcome site for the 1400 athletes. I had a good swim and came out of the water 3:40mins down on super fish Dylan McNeice and around 1:50min down on the 1st group of contenders. 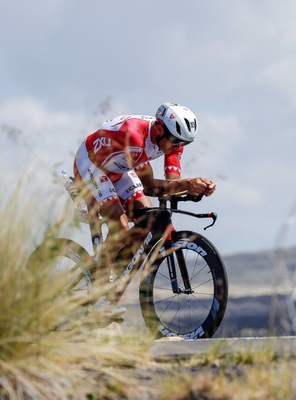 I've had a fantastic build up over the kiwi summer and I knew I was in good shape so I backed my riding and I was able to pull in the main group just after 40km. My new Merida bike was working its charm, we then rode on to catch the first group at 75km and now there 12 leading riders. You can always tell if it's going to be a good day in Taupo when you have fog out the far end of the course near the township of Reporoa, we were riding extremely quick and averaged just a shade under 42km/hr for the first 90km! Going through the special needs aid station at 95km Frenchman Cyril Viennot managed to get a small break on the field and this quickly grew to 2mins, Viennot has placed 5th and 6th and the Hawaii Ironman World Championships so I was worried that his lead wouldn't be to big before we finished the bike leg. The last 45km back to Taupo are always tough as this is where you start to tire and can easily lose a lot of time, Viennot had now stretched his lead to 3mins and that was enough to give me the kick I needed to start fighting back. Reaching T2 his lead had come back down to 2mins but he was cramping only a few hundred meters into the run. The group had now dwindled to 5 but super bikers Joe Skipper and Dougal Allan had come off the bike only 30 seconds behind, Allan had broken the bike course record set by the late Steve Larsen erasing his best by 4mins posting an amazing 4:22:13 bike split. I was more than happy with my bike time beating my previous best by 8mins! and riding a 4:29:13. All that was left was the 42km run leg! I was feeling strong but so to was Kiwi Callum Millward, the first 5km were at 3:31-32 km pace and then a 3:29 at the 6th kilometer was enough to tell me to back off and let Callum take the lead, I dropped of the pace and a gap of 50m opened up for the next 3km. I caught up again just before the 10km mark which we passed through in a fast 36:40! We were running at sub 2:40hr marathon pace through the first 21km but there were a few guys behind going even quicker so we couldn't ease of at all, kilometer after kilometer we ran shoulder to shoulder until finally I was able to open up a small gap just after 29km on the last lap. I pushed hard and within a few more km's I now had a 1min lead. I tried to enjoy the final 2km but it's always hard when your body is completely shattered. I was ecstatic at the finish line but also pretty buggered after 8:07:58hr of racing, a new course record by over 7mins! 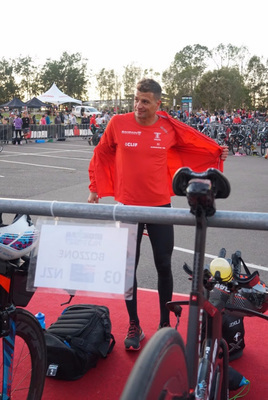 It's now time for a small break to get the body fully recovered before my next Ironman which will be the Asia-Pacific champs in Cairns, Australia on June 12th. Thanks again for your support. S 3.8km. / B 180km. / R 42.2 km.